Abe Jabri started out as a salesman for Rountry Pontiac in Petersburg, VA in 1979 where he won many awards for Salesman of the month. After, he joined Broyhill Ford and won Salesman of the Year three years in a row. In March of 1983, Abe started his own adventure which he named Abe's Auto Sales. 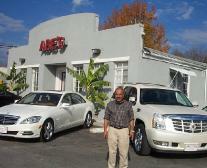 He has been President of the VIADA(Virginia Independent Automobile Dealers Association) from 1999-2000. Then was VIADA Chairman of the Board of the Second District from 2001-2002. He is very active in his community supporting local charities, schools and clubs. He is a member of the Prince George Ruritan Club as well. From the moment you step on our lot until the time you drive away in your next car, your buying experience with Abe's Auto Sales is our number one priority. We encourage you to use the expertise and resources of our sales staff; they are here to help you find the right car at the right price. Call us today at 804-862-9843 to schedule your test drive!